The Physics Locator defines the physics environment used by the Physicalize, Force and Detach behaviors and the Crowd Rigid Bodies. This environment is loaded from a Bullet Environment file or a default plane. A Physics Locator is automatically created when a Physicalize, a Force or a Detach behavior or a Crowd Rigid Body is added to the simulation. Note that several Physics Locators can be used in a simulation and can be chosen in the Crowd Manager and in each Crowd Field. Thus, if two Crowd Fields are using two different Physics Locators, their Entities will not be able to collide with each other. None : no physical object is instanciated, but gravity is still applied. Gravity Gravity to use for the physics environment. PhysX Environment File (.xml file) PhysX Environment File to load and display. By default even if no file is loaded, the Physics Locator use a center plane. This file can be generated with the 'Save Rigid Bodies' button (see bellow), or from Maya with the PhysX plugin. In Rigid Bodies Crowd Rigid Body nodes to add the current PhysX Environment. Force Refresh Display It may happens that the display of Crowd Rigid Bodies is not automatically refreshed. In such a case, click on this button to manually force a display refresh. 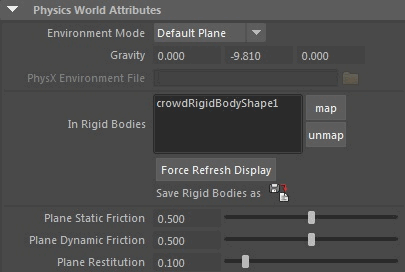 Save Rigid Bodies By clicking on this button, all rigid bodies in the 'In Rigid Bodies' list can be saved in a single file, that can later be used in the 'Environment File' attribute. Number of substeps for the Physics simulations. The highest frequency used for physics simulation, the best results will be achieved for fast and small objects, but the slowest it will be to simulate. It is usually advised to choose a number of substeps that allows the physics simulation to run at least at 60fps. For instance, if Maya is set to 24fps, 3 substeps means a physics simulation running at 3*24 = 72fps. Threads Count Number of threads to use for the physics simulation. The best value is usually the number of cores of your processor. Draw Collision shapes Show or hide the PhysX collision shapes. This option is only read when a simulation is initialized (this option considerably slows down the physics simulation: use it to check the PhysX simulation in case of problems). These options allows to connect to the NVIDIA Physx Visual Debugger (PVD). The Nvidia PVD is a tool provided by Nvidia to debug PhysX scenes, and can be useful when trying to understands what costs the most CPU time in a physics simulation. Use GPU Broadphase GPU acceleration for the collision detection part of the physX engine. This is a beta version, and only available on Windows platforms. Use GPU GRB GPU acceleration for the rigid bodies of the phsyX engine. This is a beta version, and only available on Windows platforms.